Is there a better alternative to Magic Exporter? Is Magic Exporter really the best app in Designs and Graphics category? Will Magic Exporter work good on macOS 10.13.4? Magic Exporter can quickly extract objects from your AI documents. Tired of slicing or hiding layers before exporting? This plugin exports objects in your documents separately. That means that you will be able to export even artwork with a graphic layout behind it with ease. You just need to mark the object to be exported and your work is done. Magic Exporter needs a review. Be the first to review this app and get the discussion started! Magic Exporter needs a rating. Be the first to rate this app and get the discussion started! Multiple devices and screen densities Nowadays when you design an UI, you target many kinds of devices. Each one has a unique screen density. 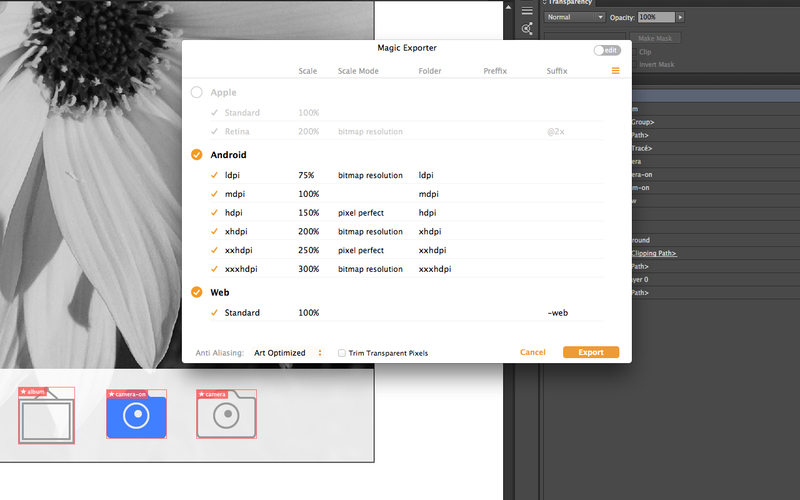 With Magic Exporter it becomes easy to create a PNG file scaled to a particular screen. You can even export multiple versions of the same object at once with custom scales. Target every platforms Whether you create images for IOS, Android and other platforms, it takes considerable time to rename files accordingly to the naming conventions of the platform. To avoid this, Magic Exporter allows you to customize and define the automated process for naming files. Keep things organized From one document you can export a large number of images. It could be painful to use them if they are saved in the same folder. With Magic Exporter, you can define subfolders for each exported objects.